This is a good sauce… but needs a balancing of flavors. It’s a sauce that would be fun to use in creative recipes to add unique spicy flavor, but it’s a little overwhelming on its own. The sauce is a dark red color with yellow chili speckles throughout. I like that the sauce has a spicy kick with garlic to round the flavor, but it still needs complimenting flavors to make it amazing. The heat comes from the chili peppers and the distilled vinegar. The spice doesn’t diminish after its cooked. Overall, it’s a yummy sauce to use in a recipe with additional flavors to compliment the taste. As the only flavor, this sauce is good but a little too overwhelming on the mouth and stomach. This sauce is thick and chunky. I would describe it as more pasty than watery as well. As far as the color, it’s red filled with speckles of yellow chili throughout. Like I said, Huy Fong Chili Garlic Sauce is thick and pasty so it’s perfect as a spicy sautéed sauce or cooked into a meal. The smell is very strong. It’s a sweet but spicy scent. You can definitely smell the garlic, chilies, and vinegar. This sauce leaves a strong aroma just from opening the bottle. Huy Fong’s Chili Garlic Sauce is actually spicy. There is definitely a bite to this sauce, so be prepared for a little kick. This is a spicy sauce with a hint of garlic that you can actually taste. In my opinion, this garlic chili sauce tastes delicious in small amounts, but a lot at once is too much. On the Huy Fong website, there are a variety of recipes that I think would be worth exploring with this sauce. The taste is a little too overwhelming on its own, but mixed into a recipe that compliments its flavor would make it amazing. Huy Fong Chili sauce has only a few main ingredients – Chili, Salt, Garlic, and Vinegar. 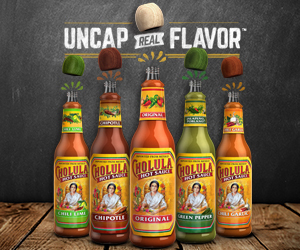 They create a unique, but strong spicy sauce. The remaining three ingredients are thickeners and preservatives. Because the ingredients are so limited, there’s not much to say about adding additional flavors or tastes. 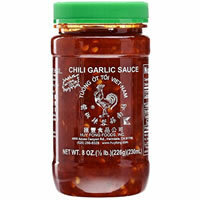 When we added Huy Fong Chili Garlic sauce to cooked chicken and allowed it to cook a bit, the sauce did not lose its kick. When the chunky pasty sauce hit the hot pan, it filled my home with a strong aroma. The sauce still had the sweet and spicy scent, but the aroma was much stronger and potent- I would argue a little too overwhelming. I found that the sauce was delicious on the chicken in very small amounts, but to make it better, it needs additional flavors to round out the taste. With only the sauce on the chicken, although a yummy sauce it was a little too overwhelming. I could only manage a little bit at a time. If you’re going to cook with this sauce, it needs other ingredients to balance the spicy flavor. I suggest checking out the Huy Fong website for recipes. It comes in different sizes. But the 8 oz bottle costs only $4.48. That’s not too bad at all. Obviously, depending on where you purchase the sauce, the price will vary.